Everything first. 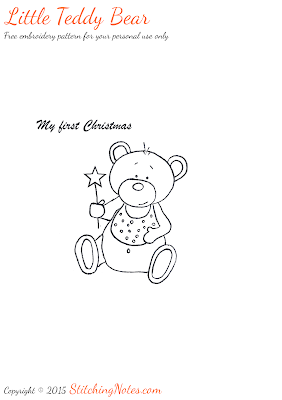 First cuddles and kisses, first favourite toy, Winter and Spring, first visit to a beach, first walk in a park, first pretty flower and the feel of soft grass under tiny feet, first taste of berries and cookies, and of course the ever first Christmas. So sweet! 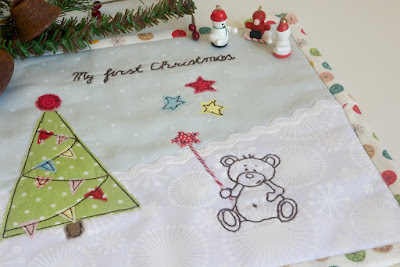 "My first Christmas" placemat for our Little One. 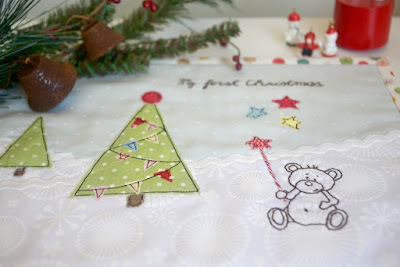 A small but very special and cute project that was inspired by the Little Teddy Bear embroidery that I used for a baby onesie. 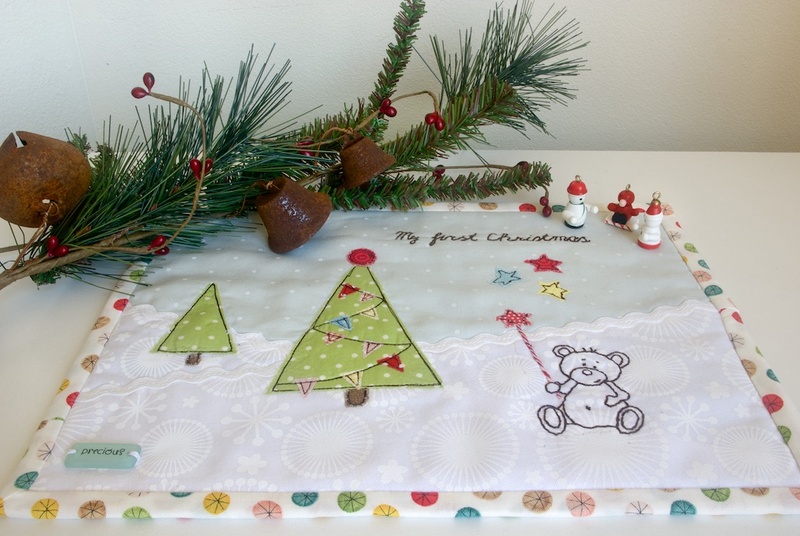 First I made the snowy slopes using the white printed cotton. The print on it matches the winter theme really well. 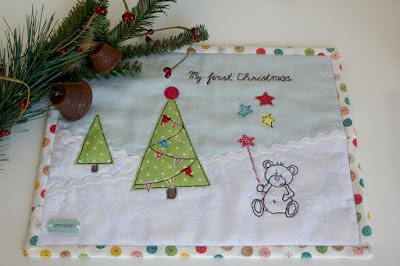 I added the sky in light blue cotton with white polka dots that look like falling snow. I topped the slopes with some rick rack trim to soften the edges. The trees were very simple to make. 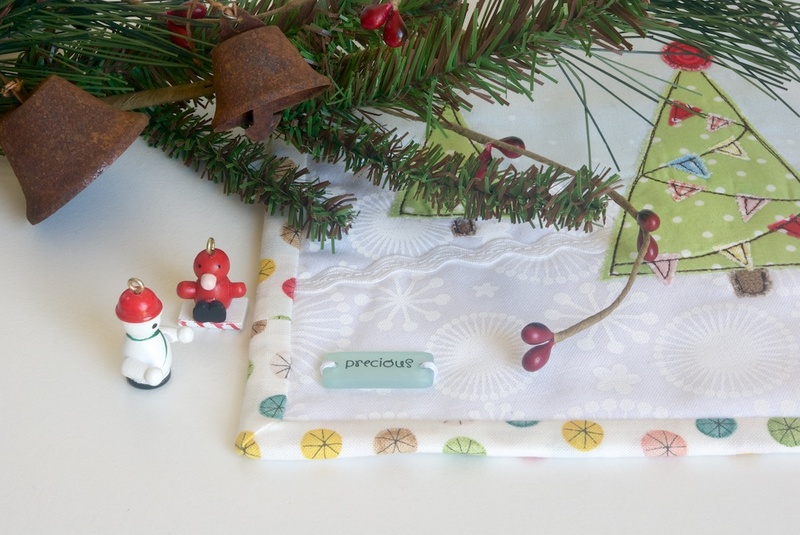 I chose the green cotton with white polka dots so it seems like the snow keeps falling on and on. I put some festive flags on the Christmas tree and a bright red top. A few bright stars and of course this Little Chap had to hold one too. A simple sign and a joyful binding around the mat to match the flags and the stars. I had this white with coloured circles cotton for a while and tried using it for various projects but could never find the right pairing for it until now. Oh, it's so cute, Larisa! I love it!